Are there stable long-range ordered Fe1-xCrx compounds? 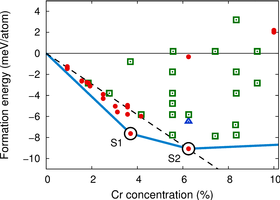 The heat of formation of Fe-Cr alloys undergoes an anomalous change of sign at small Cr concentrations. 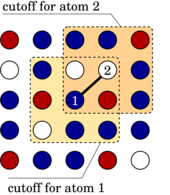 This observation raises the question as to whether there are intermetallic phases present in this composition range. Here, we report the discovery of several long-range ordered structures that represent ground state phases at 0 K. In particular, we have identified a structure at 3.7% Cr with an embedding energy which is 49 meV/Cr atom below the solid solution. This implies that there is an effective long-range attractive interaction between Cr atoms. 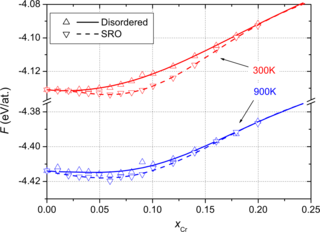 We propose that the structures found in this study complete the low temperature-low Cr region of the phase diagram.